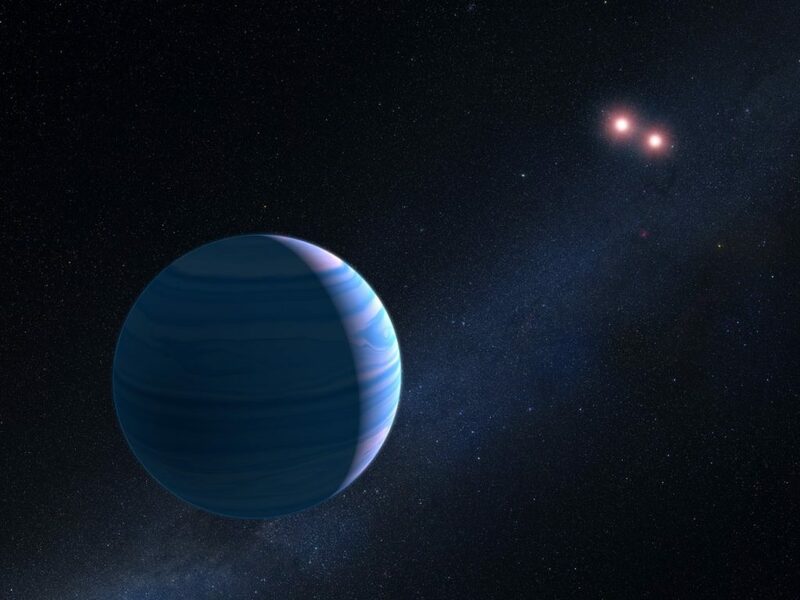 September 22, 2016 – A distant planet orbiting two stars, found by its warping of spacetime, has been confirmed using observations from the NASA/ESA Hubble Space Telescope. The planet’s mass caused what is known as a microlensing event, where light is bent by an object’s gravitational field. The event was observed in 2007, making this the first circumbinary planet to be confirmed following detection of a microlensing event. The majority of exoplanets detected so far orbit single stars. Only a few circumbinary planets — planets orbiting two stars — have been discovered to date. Most of these circumbinaries have been detected by NASA’s Kepler mission, which uses the transit method for detection. This newly discovered planet, however, is very unusual. “The exoplanet was observed as a microlensing event in 2007. A detailed analysis revealed a third lensing body in addition to the star and planet that were quite obvious from the data,” says David Bennett from the NASA Goddard Space Flight Center, USA, lead author of the study. The event, OGLE-2007-BLG-349, was detected during the Optical Gravitational Lensing Experiment (OGLE). OGLE searches for and observes effects from small distortions of spacetime, caused by stars and exoplanets, which were predicted by Einstein in his theory of General Relativity. These small distortions are known as microlensing. However, the OGLE observation could not confirm the details of the OGLE-2007-BLG-349 event on its own, especially the nature of the third, unknown lensing body. A number of models could have explained the observed light curve. Now, nine years later, astronomers have used ultra-sharp images from the Hubble Space Telescope to determine that the system consists of a Saturn-mass planet circling two diminutive, faint stars in a tight orbit around each other. The system resides 8,000 light-years away from Earth. The sharpness of the Hubble images allowed the research team to separate the background source star and the lensing star from their neighbors in the very crowded star field. The Hubble observations revealed that the starlight from the foreground lens system was too faint to be a single star, but it had the brightness expected for two closely orbiting red dwarf stars, which are fainter and less massive than our sun. “So, the model with two stars and one planet is the only one consistent with the Hubble data,” Bennett said. “OGLE has detected over 17,000 microlensing events, but this is the first time such an event has been caused by a circumbinary planetary system,” explains Andrzej Udalski from the University of Warsaw, Poland, co-author of the study.